When someone mentions the trucking industry, the image of a lone person driving around in a big rig usually comes to mind. But the trucking industry as a whole is so much more. It is a team industry. It’s a noble industry. This is a message TransAm Trucking takes to heart. Everyone at TransAm Trucking works together to meet our goals of offering excellent customer service while maintaining a communicative work environment. Planners help find loads for the drivers. Dispatchers (AKA Driver Managers) help dispatch drivers on the loads and give continual support to help keep them moving. Plus, there’s the additional personnel to help with permits, payroll, settlements, emergency roadside assistance, and much more. We all work together to ensure our drivers’ success because drivers are the stars of the industry. 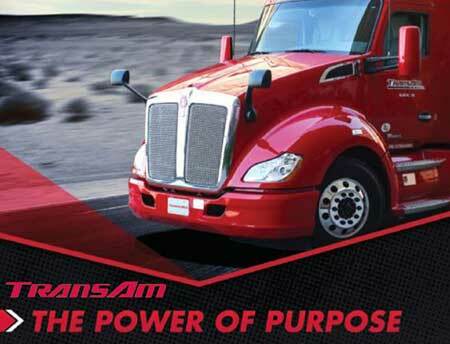 Without drivers, there is no TransAm Trucking. Today we honor a star that has made his home and career with TransAm Trucking: Paul Kennedy. Paul is the epitome of what it means to be a TransAm Trucking driver. He is friendly, dependable, and safety conscious. He takes pride in his work and we are privileged to have him as part of the TransAm Trucking team. Behind every successful driver is a supportive team. For Paul Kennedy, that team is TransAm Trucking. Paul joined TransAm Trucking as a company driver shortly after the company’s formation. This November will mark the 28th year of our partnership. The key to the trucking industry is a beneficial partnership between driver and company. Paul knows he can count on us to offer assistance while he’s over the road and we trust Paul to get the job done. It’s a relationship built on mutual respect and hard work. Drivers like Paul make TransAm Trucking the company it is today. Long haul driving means coming in contact with all types of weather and road conditions. It’s important to stay vigilant and aware of your surroundings at all times. Paul Kennedy takes this to heart. In his 28 years and 3 million miles of driving with TransAm Trucking, he has never caused an accident. Speeding is also not in Paul’s vocabulary. He’s consistently one of our DriveCam Top Performers. Paul takes pride in what he does and it shows in his safety record. He works hard to keep himself and others safe while he’s over-the-road. There is approximately 3 million miles of paved road in the United States. Paul Kennedy has driven the equivalent of all of them. This November marks Paul’s 28th year and 3 million driven miles with TransAm Trucking. He started driving with TransAm in November 1988 and 28 years later, Paul and TransAm Trucking are still trucking along. Paul has never had a late load during his career. In addition to making sure each load reaches its destination on time, Paul also takes care to ensure the load arrives in pristine condition. This means meticulously verifying the reefer temperature while hauling temperature-controlled loads and keeping the equipment clean. Paul takes pride in a job well done and we take pride in Paul. Paul Kennedy exemplifies what it means to be a TransAm Trucking driver. He is a hardworking, team player who can be depended upon to haul freight safely and efficiently. At TransAm Trucking, we are honored he has chosen to spend his long career as a company driver with us. We could not ask for a better employee. Thank you, Paul Kennedy. Congratulations on your 3-million-mile achievement.